Set comes with truck, box with all packing & measures approximately 11″ in length. This truck, a 1933 Chevrolet Fuel Oil Delivery Truck, is an exact replica of the first delivery truck driven by Leon Hess, the founder of Hess Oil. It features a rubber oil delivery hose that pulls out of the side and easily rewinds on its spool. A switch underneath the truck operates the working headlights and taillights. Only difference in the 1982 and 1983 edition is the color of the on-off switch. 1982 has a red light switch on the bottom of the truck, the 1983 has the black switch. 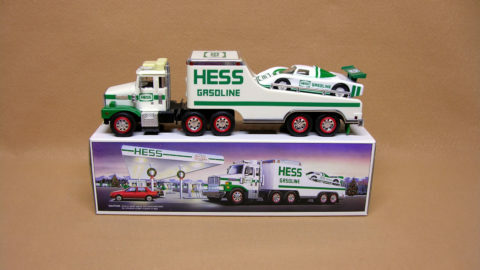 The truck is in mint condition and a great edition to any collection. Battery compartment is clean and all the lights are in working order. Box is in mint condition and a great display piece (see pic). The box has bright graphics with slight crease wear on one end flap which is usual for its age. Comes complete with both top & bottom inserts. 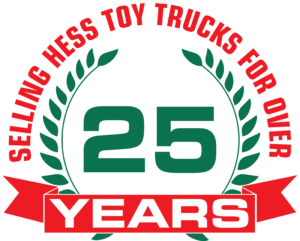 The truck measures approximately 11″ in length.